This luxurious four-bedroom villa on the Thai island of Koh Samui offers a little something for everyone – from the huge private pool to a prime beach-front location, and even a traditional Thai Sala, complete with Balinese bed, from which to enjoy the exquisite view. On arrival, you will find private parking that leads to a quaint stone path through your private landscaped garden with a fabulous lily pond to greet you. Beyond this is the main living space with two large sofas in front of the flat-screen TV, with an elegant table for ten at one end. A bright, modern kitchen extends from the living area giving you the freedom to prepare snacks and meals as and when you please – but don't worry if you don't feel like cooking, as our range of staff includes an in-house Chef, alongside your villa manager and maid! Dining at Villa Rochana will bring you a thrice daily joy, with delectable food served with a breath-taking sea-view, and a free breakfast every morning to get your day off to the best possible start. All four spacious and elegant bedrooms are side-by-side to the left of the beautiful pond as you enter the villa grounds. The first two rooms, two twins with two super single beds each, enjoy a little more privacy, slightly tucked away towards the back of the garden. They feature a desk, plenty of storage and large patio doors to the garden. The next two rooms, large doubles with king-size beds, are finished to the same exceptionally high standard. All the bedrooms are framed by glossy teak flooring and vaulted timber ceilings. Each is equipped with luxurious ensuite shower rooms, air conditioning, and walk-in closets. The master bedroom is the closest to the beach, and as well as a private patio with astonishing sea-views also has a bathtub, so you can soak off and unwind in a luxurious setting. 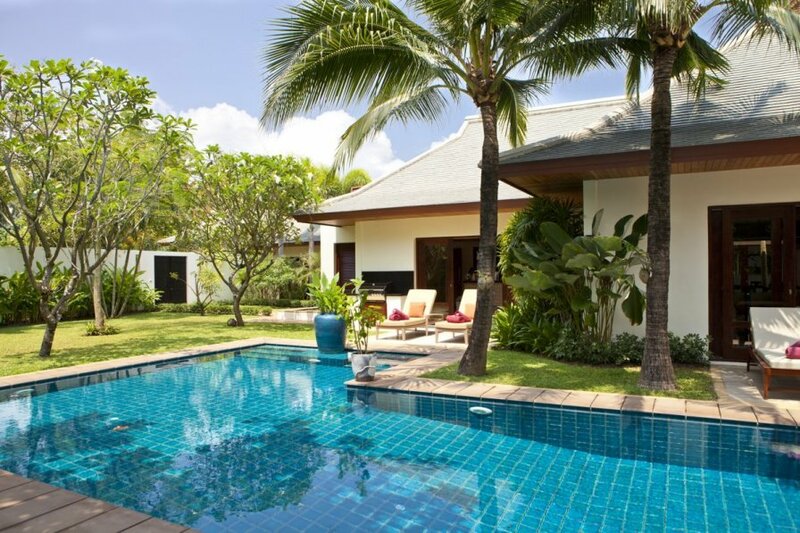 In the beautiful garden, an L-shaped pool leads from the kitchen patio space right around the living/dining room and up to a traditional Thai Sala overlooking the beach, complete with a Balinese-style bed. Four sun loungers are nestled in amongst the exotic trees and plants across the fabulous lawn and offer a relaxing spot to catch some sun. A large hedge around the perimeter maintains your privacy while a barbeque allows you to spice up meal times. A huge outdoor dining area with ceiling fans ensures you can enjoy a magnificent alfresco meal, or two! Villa Rochana is located on the tranquil Mae Nam beach, a five-kilometre stretch of palm-lined, pristine white sand famous for its glorious sunsets.